I built this to give the two Elite droids from the BP a better vehicle than the speeder given in the pack. More detailed, and larger, pictures are in the photostream. 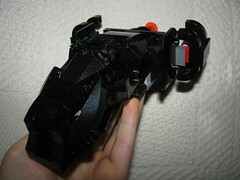 Well, black is the worst colour for the detailing, but from what I can see, it's a nicely-shaped, cool little ship. The black colour suits it well, and the nose of the ship looks particularly impressive. The back, on the other hand, looks quite boxy. Some greebling could fit there, as well as on the side engines. As for colouring, I'd suggest trying to change the red, green and light grey to dark blue or dark grey if only possible; that would look more uniform. Some deeplinks wouldn't hurt, by the way. It's somewhat difficult to try find the rigth pics in your photostream. And about the links, sorry; I was uploading like crazy today to fill the January capacity so I would be able to start fresh in a few days, and by and large, each set got pushed down. This links to the pic on Flickr so you can scroll through my photostream and thus access the pictures directly.